The problem may be complex and divisive, but for the children defined by immigration law as “unaccompanied minors,” the needs are fundamental. With no home, no parents, no family, little English, and a country of origin where violence has made life unlivable, these kids need a chance to be kids, if only for a moment. That’s how Mutt-i-grees® is helping. They are the children behind the headlines: thousands of refugees separated from their families at our southern border, waiting while politicians and others sort through this complex and divisive problem. Many of these children have been brought to New York and placed in temporary care. 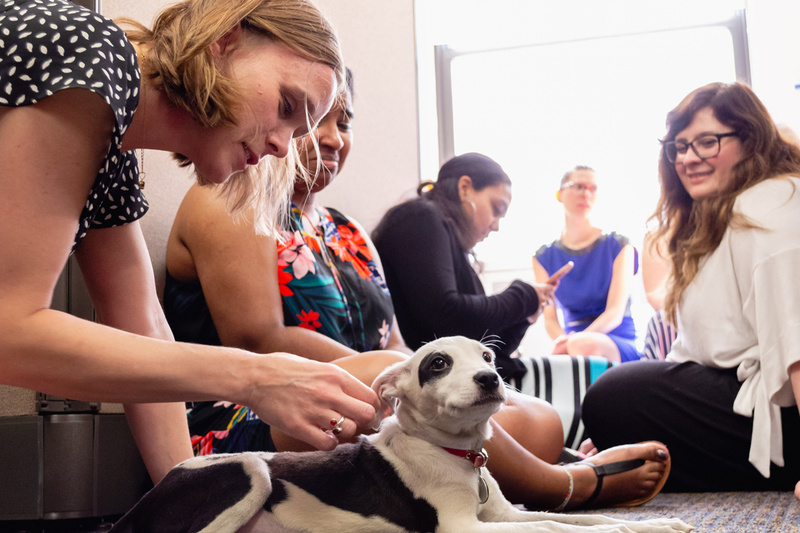 Our Mutt-i-grees Outreach Team recently joined with Catholic Charities to bring a bit of canine comfort into their lives. For decades, Catholic Charities, Archdiocese of New York, has helped immigrants reunite legally with their families, obtain proper work authorization, learn English and civics, and prepare to pass citizenship exams. Catholic Charities also provides legal advice and assists immigrants in avoiding exploitation by unscrupulous practitioners. Today, this organization is working with other area agencies to help the many children who find themselves alone and terrified due to recent policy decisions by the federal government. According to Jayne Vitale, Mutt-i-grees Director of Outreach and Youth Development Services, the Curriculum brings “something simple yet powerful” to both the children and the staff at Catholic Charities. This is how Jayne described a recent visit.